The malleus appears to be very human-like, the findings show, while the incus and stapes resemble those of a more chimpanzee-like, or ape-like creature. Since both modern humans and our early ancestors share this human-like malleus, the changes in this bone must have occurred very early in our evolutionary history. "The discovery is important for two reasons," de Ruiter explains. 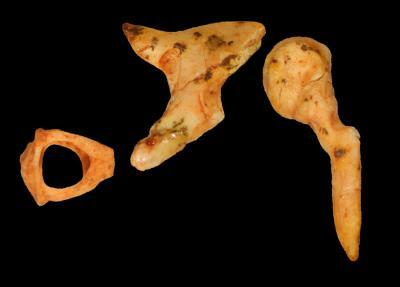 "First, ear ossicles are fully formed and adult-sized at birth, and they do not undergo any type of anatomical change in an individual lifetime. Thus, they are a very close representation of genetic expression. Second, these bones show that their hearing ability was different from that of humans – not necessarily better or worse, but certainly different. "They are among the rarest of fossils that can be recovered," de Ruiter adds. "Bipedalism (walking on two feet) and a reduction in the size of the canine teeth have long been held to be 'hallmarks of humanity' since they seem to be present in the earliest human fossils recovered to date. Our study suggests that the list may need to be updated to include changes in the malleus as well." de Ruiter recently authored a series of papers in Science magazine that demonstrate the intermediate nature of the closely related species, Australopithecus sediba, and provide strong support that this species lies rather close to the ancestry of Homo sapiens. The current study could yield additional new clues to human development and answer key questions of the evolution of the human lineage. The team's research was funded by the National Research Foundation of South Africa, and by the Ray A. Rothrock Fellowship at Texas A&M.